Only few weeks left till the Valentine`s Day – a romantic holiday when loving couples exchange gifts and express their feelings to each other. Many of us are already looking for the best place to invite beloved one for a date on this special occasion. Luckily, Kyiv has many lovely restaurants to spend the St. Valentine`s Day in the right way. This cozy restaurant in the heart of the capital embraces three floors – each with its own individual design and details. However, all halls are also united by common features such as Colonial style, soft comfortable sofas, lights colors, smooth light and numerous photos on the walls. Varadero restaurant can boast its own fireplace lounge decorated with bottles of elite alcohol. The restaurant`s menu perfectly combines authentic Odesa cuisine with classic European dishes. Here you can try such delicacies as the Black Sea flatfish, pike perch steak and apple strudel with ice cream for dessert. In this case, the restaurant`s name speaks for itself. What can be a better place for a date than a restaurant named after Shakespeare`s most famous love story? The romance starts at the restaurant`s entrance where guests see a beautiful sculpture of Romeo and Juliette. The restaurant has two spacious halls (Montecchi and Capuleti) that please the eye with authentic design with exclusive lusters, floor lamps shaped as cats and dogs, gypsum panel pictures, paintings and so on. The menu offers all wonders of traditional Italian cuisine such as pasta fresca, ravioli, Neapolitan pizza, bruschetta, carpaccio, Sicilian cannoli, panna cotta, tiramisu with limoncello. Of course, here you can also try wide variety of wines from different regions of Italy. If you dream to travel with your crush to New York, Black Market restaurant is the solution. The interior of the dining spot embodies the spirit of this dynamic cosmopolitan city. The restaurant has several halls and a large summer terrace. Here guests have an option of having a dinner in an elegant separate room – a perfect choice for a romantic date. Black Market restaurant`s menu consists of modern signature dishes. 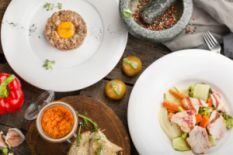 Here you can taste many delicious dishes made of meat, fish and seafood with unusual ingredients cooked by the newest technologies – for example, exotic parrot fish or Ossobuco veal. The wine menu includes wines from many countries. The wines are sorted by tastes and character: from light & fresh and to strong & rich flavors. Re`lux is a place with unique format uniting restaurant and cinema. Sounds just great for a date, isn`t it? Re`lux offers three halls for those who love watching movies with their loved one in an intimate atmosphere, enjoying delicious food and drinks at the same time. Here you will find large soft chairs that can be fold-out into a comfortable sofa with regulated slope angle of back and footrest. The boxes also have lighting, small table and iPad for making orders. Silent and tactful waiters serve tasty light dishes in finger food format – for example, spring rolls with beef, taco with shrimps, panna cotta and tiramisu. The menu also offers 17 signature cocktails (such as cocktail with caramel popcorn and whiskey) and classic drinks. This charming Italian restaurant in Kyiv embraces three floors. 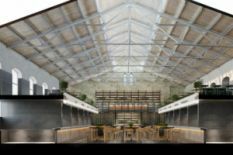 On the top floor, you will find spacious hall with elegant design and live music in evenings; the basement hides a large enoteca with a separate cheese room; and the first floor is a small Italian pizzeria with a wood-fired oven. The restaurant`s menu unites all the best masterpieces of Italian cuisine. Here you can taste many kinds of pasta, antipasti, pizza, meat and fish dishes. You will definitely not regret ordering brand beef tartare or cheese risotto. Besides, the menu offers unbelievably wide choice of drinks – more than 1000 wines from all corners of the world, 100 kinds of champagne and sparkling wines, 50 kinds of Grappa. By the way, guests can not only drink wine in the restaurant, but also take it home. France, and especially its capital – Paris, has always been famous for unique romantic spirit, which is reflected in many books, movies and artworks. Therefore, inviting your beloved to a French restaurant for the Valentine`s Day just cannot be the wrong idea. Tres Francais restaurant in the heart of Kyiv embodies character and traditions of France. The dining spot has four halls designed in warm colors with many interesting decor elements that create true French atmosphere. Art hall or Jardine hall will be an excellent choice for a date and love confession. As for food, Tres Francais will delight you with the best French delicacies like quiches, goose liver with apples or Escargots (Burgundy snails). Wines from the different regions of France and soulful French music will add finishing touch to your special dinner. Terracotta restaurant instantly impresses with large windows opening a panoramic view over the historical Kyiv. Observing this beauty, you will get into romantic mood right away. The restaurant has two spacious halls and three VIP rooms – one of them even with a fireplace. Besides, Terracotta has wine chamber where true gourmands can pick the best drinks. The menu provides a great choice of dishes typical for Mediterranean region – lots of fish and seafood, meat and fresh vegetables. For example, you might order pike caviar with cream or salad with grilled shrimps and avocado, and then proceed to tasty dessert –fondant with strawberry sorbet. We wish you to feel the power of love on the Valentine`s Day as well as on all other 364 days of the year!